The potatoes turn out crispy on the outside, yet light and fluffy on the inside. And with this delicious seasoning with garlic powder, oregano, thyme and parsley they are perfection. It’s making me hungry just thinking about it! Potatoes on the smoker, don’t you just love the sound of that?!! 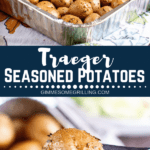 We are all about potatoes in our house AND all about how easy this is to make! Bonus? The kids love them too – simple flavors perfectly cooked! If you love the recipe for Smoked Cheesy Potato Casserole or Smoked Baked Potatoes you’ll love this dish too! This recipe was born because I actually grabbed a “pre-made” packet of potatoes just like this at the grocery store. I literally took the top off the foil pan, dumped in the seasoning and add a little olive oil. They were so good that I had to make my own “copycat” recipe! 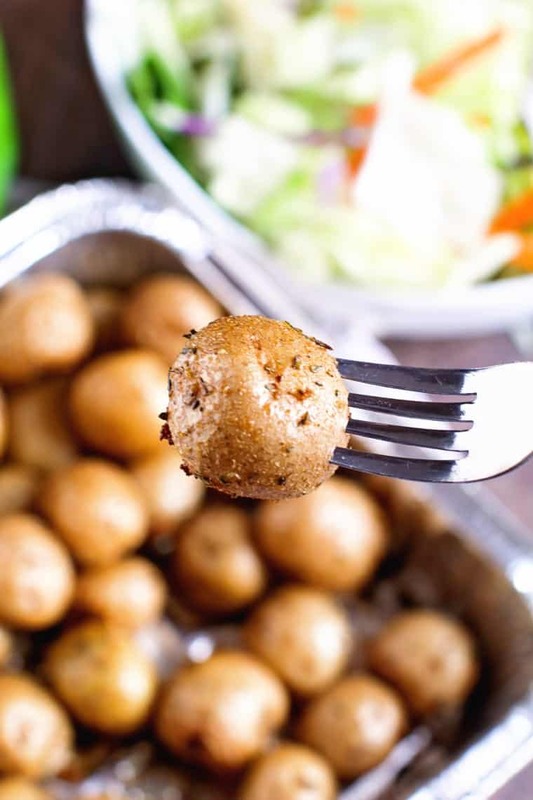 What is the best seasonings for potatoes? You’ll have everything you need in your pantry, no need to go to the store and get some special seasoning! 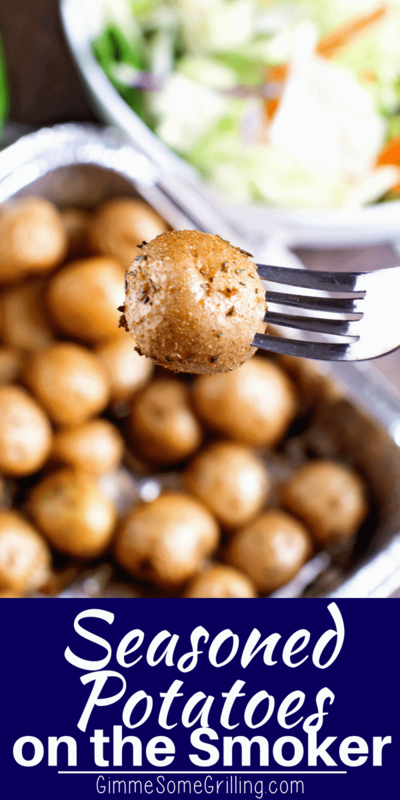 This recipe uses tender baby or “creamer” potatoes. Harvesting them in the early keeps them tender. The small size makes them fun for the little ones and easy serving too. Creamer potatoes come in white, yellow or red varieties, choose your favorite. Look for plump potatoes, do not choose potatoes with shriveled skin or potatoes that are beginning to sprout. Avoid potato that have a “green” appearance. Those are not quite ripe and will not have good flavor. Choosing potatoes of a uniform size will ensure they will all be done at the same time. The beauty in this dish is the simplicity! Here are the simple steps to make this delicious side dish! 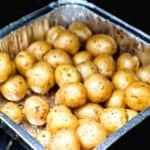 What is the best method to store potatoes? 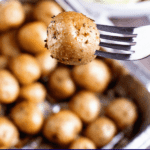 Store potatoes in a cool dark place – not the refrigerator! The cold temperatures of the fridge will turn the starch of the potatoes into sugar. They become sweet and can discolor when cooked. Potatoes will keep at room temperature for up to two weeks. Best bet? Buy as many as you’ll use in a week. Spray the foil pan with non-stick cooking spray. Add all of the ingredients into the pan – mix well and onto the grill it goes. How long does it take to cook the potato? Only about 45 minutes! Just about the time it takes to put together a few wonderful eats to serve alongside! You’ll definitely want to make a double batch of these potatoes. Leftover potatoes are great for breakfast, lunch or dinner! Adding leftover potatoes to a quiche, frittata or breakfast casserole is a great way to stretch out a meal and adding additional flavor and texture. Serve these up with Southwestern Pork Chops – so tasty! More recipes for potatoes on the grill? 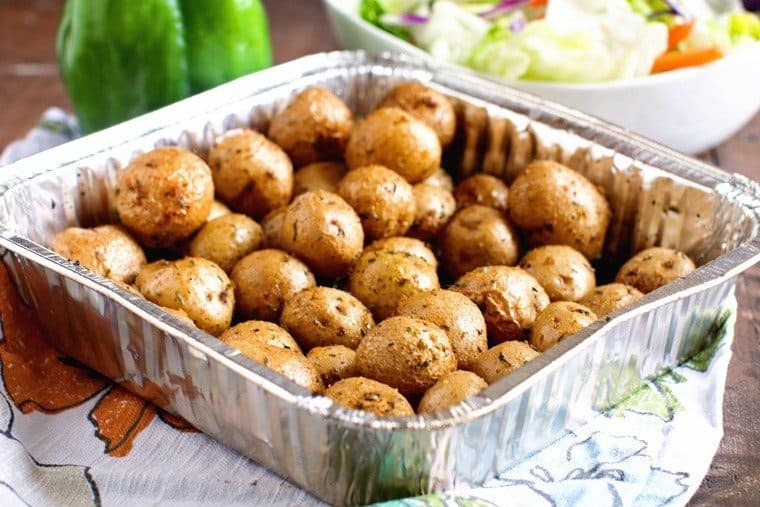 Baked Potatoes on the Grill – these have become my “go-to” side dish recipe because they are so easy and so delicious! Plus, so many topping options to keep it fresh. Garlic Hasselback Potatoes on the Grill – you had me sold at garlic! These have so much flavor! Grilled BBQ Bacon Twice Baked Potatoes – tender potatoes shells stuffed with mashed potatoes, topped with barbecue sauce, cheese and bacon. These will make your mouth water! Cheesy Potatoes on Grill with Bacon – diced potatoes loaded with butter, onions, bacon and cheese grilled in a foil pan for quick and easy clean up! 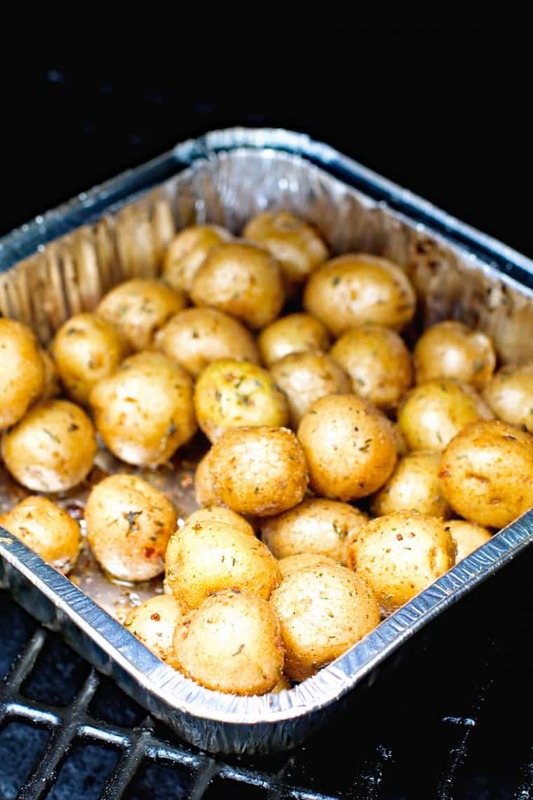 Spray an 8'' x 8'' foil pan with non stick spray. Mix all ingredients in pan. Place in pellet grill. Cook about 45 minutes or until potatoes are cooked through, stirring about every 15 minutes.